To close out 2018, I helped set up a photo booth for my friend’s New Year Party. This is the first time I’ve set something up like this. Overall, I would say that it was a pretty successful. My main goal was to set up a photo booth where I didn’t need to be present to take the photos or monitor it all night long. There were a few quirks to iron out here and there and some things that could be tidied up a bit for the next time, but for something hodge podged together for the first time I was pretty satisfied. I wanted to see what kind of software was out there for what I had in mind. I wanted something that could utilize my DSLR and be self-operating without needing to stand next to the booth the whole time. I was envisioning being able to offer this service for event photography without taking away from my time to photograph the event or hiring someone to help operate the photo booth. There were a few options available and after a few hours spent researching and watching Youtube videos, I decided to settle on DSLR Booth. This software has a lot of great features that I have yet to fully unpack. It was relatively easy to set up and get running quickly. There is a custom layout designer which is one of the least intuitive parts of the program. It wasn’t confusing to use necessarily, just frustratingly lacking when compared to InDesign or even Bluebeam. The software requires hooking into either a PC or Mac as opposed to a tablet like the iPad because of the DSLR tethering functions. It supports touchscreen monitors—which was ideal as I would prefer guests to not be touching my laptop. It also supports both of my cameras—the Nikon D810 and D300—along with a plethora of other camera models from the major manufacturers. This provides me the flexibility to utilize my D300 on the photo booth while I can use my D810 to photograph the event. The software license is stated to only work on one machine only, so if you plan on using a dedicated laptop other than your main working laptop for this then I would recommend registering the license on that laptop only. Knowing most software companies though, if you simply give them a call and talk to support they should be able to help you out in the event you do need to transfer the license to a new laptop. First and foremost, this software needs to be downloaded and operated on a PC or Mac. Since I am currently using my MacBook Pro, that’s what I downloaded it on. Fortunately, this version still has all the ports that I need. I need a USB port to connect the camera to the computer. I also need an HDMI port and a USB port to connect the touch screen monitor to the computer. I had an old external 10-point multi touch screen monitor that I used during grad school. I just looked up the monitor and it’s still being sold and it’s more expensive now. Crazy. This is a nice and large monitor at 23 inches. I’m still on the fence whether or not this is too large of a monitor. I guess if I was limited to a smaller space, it might be considered too big. And if I were to mount this monitor onto a stand, I would need to get a pretty hefty stand. I’m currently planning on only using the monitor on a table or stool or something. In the future if this photo booth service becomes more popular, I may invest in an iPad Pro and use it as an external monitor with Duet Display or something. The main hardware that I invested in for this setup was the 18” ring light. I’ve always been interested in getting one for portrait lighting and this was a perfect opportunity for me to purchase one. It also came with its own light stand so that was a bonus. I’m excited to be able to use this light for other kinds of photography in the future. I think I would use my D300 for most events, but since I wasn’t taking photos at this party, I figured I’d try it out with the D810 first. I did test it with the D300 at home and it worked just the same. Setting up the software took a little bit of time. I had to first figure out all of the settings I wanted to do—how many seconds to wait between photos, what kind of features I want to show, how many ways to deliver the photos, etc. I also had to set up a layout for the photo. I decided to go with six photos in a strip—though it seemed like some people would have preferred four photos. I created a brief Happy New Year message and branded it with a small logo of the host’s firm. This was probably my least favorite part of the software because of how overly complicated they made it to create a template. A little bit into the evening, it was evident that the start screen could use some instructions of how to operate the booth. So I quickly created a set of text instructions in InDesign and exported it as an image and uploaded that as a background image of the start screen. I will probably refine this a little bit better for future events now that I know that some instructions would be needed. Unfortunately, I did not take a picture of my photo booth setup for this party as I was busy trying to set everything up and make sure everything was going to work as intended. Instead, I’ll try to describe how everything was put together as best as I can. The photo booth was actually in its own little rectangular room instead of out in the open of a larger space, which was nice. The door is on the short wall. The background was placed along the long wall of the room with a table on the opposite wall under a window for the props and touch screen monitor. The distance between the camera and the people was a bit too short for my preference, but we were able to make it work. Due to the placement of the table, we had to place the camera tripod on the table. I wanted the monitor to be centered in front of the camera and the light ring. Unfortunately, the lighting stand was too tall to be placed on the table, so I set the light stand on the floor right in front of the table, but had to shift the monitor off center a bit. This wasn’t how I would have optimally set up the booth, but this was the best solution for the room that we were in. After a few quirks to work out and some last second fixes, the photo booth turned out to be quite the hit. It started off a bit slow, but as the evening went on, more and more people started to use it. Some of the photos were quite creative! 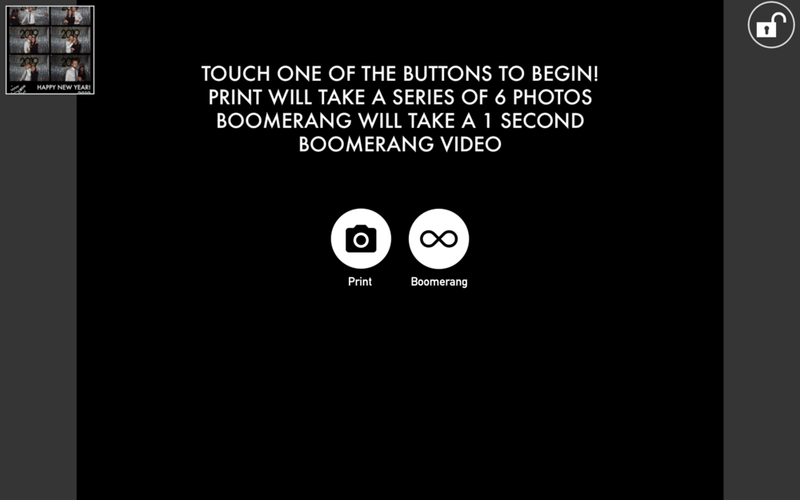 A lot of people also enjoyed the Boomerang feature. It was fun to see what everyone could come up with. While I would consider this photo booth a success, there a few things that I can make it even better. There were two types of blurs that I notice from time to time in the photos. The first type is motion blur due to the shutter speed being too slow and the second type is a focus blur due to the depth of field being too shallow. I need to address the first type by increasing the shutter speed and the second type by decreasing the aperture. There are a couple ways that I can help achieve these solutions. The first way is to increase the ISO a significant amount. The second way is to increase the light output. Since the room was relatively dark to begin with and the ring light was already intensely bright, it was difficult to turn up the light output from the ring light. I probably could have increased the ISO a little bit and increased the ring light output a little bit. The most likely solution I would employ is to add a speedlight that would help fill in the needed light output without being too intense on the eyes. Another aspect of the booth that I can try to improve upon is the placement of the touchscreen monitor. I need to find a way to minimize the amount of people looking at the monitor instead of the camera lens. I could find a way to move the monitor closer to the lens, but that may result in more people looking at the monitor since it’s harder to realize that looking at the monitor means not looking at the lens while having the monitor further away from the lens would make it more obvious that the monitor is not the camera. I could also find a way to display a message on the monitor to look at the lens, but I would need to explore the software a bit more. Another option would be to turn off the live view preview before the photo, but I think it’s better to actually see how you’re positioned in the frame before the photo gets taken. This is one reason why I think a smaller touchscreen might come in handy. While there are a few things I can do to improve on providing the best photo booth quality and experience, at the end of the day the most important aspect of the photo booth is that people have fun taking photos.